So where does all this talk about up and down get us? Much like a number of classes that I’ve taken recently from Bobby and Kate or at The Experiment, the idea here is that self knowledge allows you to better assess both strengths and weaknesses. By knowing your strengths, you can pick motions and stylings that appeal to your natural tendencies and by knowing your “weaknesses” you can start to view them as simply areas for improvement and then work on them. For instance, I recently realized in the course of writing this article, that the way I originally learned Charleston lacked up energy. For years my Charleston has felt heavy and clunky and it wasn’t obvious why. When I began working with including Up in my Charleston, my dancing immediately began to feel lighter and more dynamic, and my pulse felt more in-tune with the music. Developing a stronger vertical orientation tends to work best through the cultivation of imagery. While you can get some benefit out of simply thinking “There’s no place like up,” most people find that creating more detailed imagery helps them make progress faster. Below are a few examples of such imagery which you can use as is or to inspire your own imagery. My favorite image for accessing up is a variation on Christmas ornaments. Imagine a string suspending you from the ceiling or some other imagined point above you. Start with the idea of a string attached to the top of your head that is being pulled gently upwards. As it pulls upwards, allow your body to hang from the string, dangling freely beneath your head. Notice if your spine or neck lengthen or relax and how your weight shifts on your feet. As you get comfortable with the lifted feeling in your spine, you can begin to play with adding imaginary strings to the arms, legs, feet, and hands, imagining yourself as a marionette. Up imagery can also be used to exhance down movements. Most of us find our shoulders creeping up towards our ears in times of stress. In such situation, it can be difficult to directly push the shoulders back and down. However, allowing your shoulders to actively rise up can prime them to relax and sink back to a less strained position. To try this, create an image of your shoulders being suspended from strings then imagine the strings pulling upward, lifting your shoulders towards your head. Settle into this lifted feeling for a few breaths, then slowly imagine the strings releasing downward and allow the weight of your shoulders and arms arms to sink with them. Keep imagining the strings slowly releasing downward until you reach an end point and notice if your shoulders have changed position. Down is an idea that shows up a lot in Lindy. Concepts like pulse, using the floor, and counter-balance all require use of down energy, typically in ways that we don’t necessarily practice in daily life. I find most people can conceptually understand the idea of using the floor or grounding, but it frequently takes some deeper work to be able to feel down energy for themselves and understand it on a visceral level. The image I like to use to access down energy is growing roots. Start from standing or sitting, preferably in bare feet and a comfortable position. Imagine your feet or your tailbone beginning to grow long tap roots down into the floor. Allow the image of the roots to expand at it’s own pace and notice if your posture shifts or settles in reaction to the image of roots. 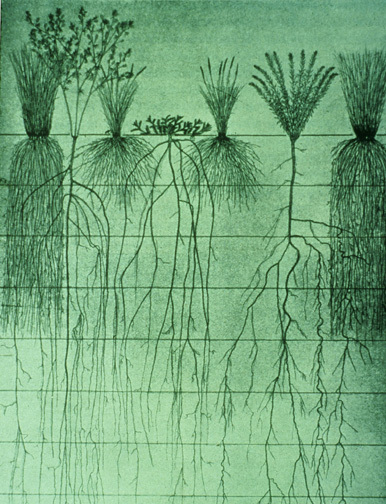 As they grow, you can imagine the roots going deeper or spreading outward with a wider reach. Allow the root image to expand to a comfortable distance and settle into it for a minute or two. Notice any energetic or emotional shifts, for instance many people find a strong down image helps foster a sense of calm and stability. As you gain confidence with the down imagery, you can start taking it into motions like walking, imaging roots reaching into the ground with each step. The better you get at pushing or rooting through the ground this way, the more it can support upward movements as well. For instance, in jumping, you can get more height by pushing off the floor as if you were pushing through it rather than pushing at the surface of it. And serious power lifters derive their power in moves like squats not just from pushing at the floor but pushing through it. The general concept of these images is to help create attention beyond the physical confines of your body. This expanded attention helps gives you more sensory input which helps with orienting motion and creating extension in movements. By expanding the sense of space that your body can move in, more of your muscle becomes active in creating motion and the outward attention helps to activate deep postural muscles. The more comfortable your sensory system is extending attention beyond your body, the more readily your body will create action into those spaces. While these exercises may not immediately seem dance related, the concepts they help you access can be seen in many great dancers. They won’t make you an amazing dancer overnight, but consistent practice will help open up new avenues for movement and expression. I would like to leave you with an image of what is possible with this sort of expansive attention and presence. Mikhail Baryshnikov at 5′ 6″ was not a large man, but his immense presence on stage gave him an amazing ability to seem as if he could fill the whole space with his dancing alone. I could go into detail describing this, but I think it’s best to let his dancing do the talking.